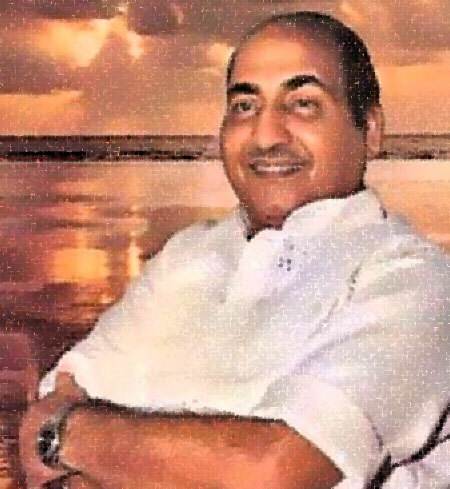 24th December will mark the birthday of our beloved King of Melody Mohammed Rafi Saab. This day a Melodious & Sweet Velvet voice was born almost 84 years ago to be destined as the Greatest Ever to rule the Music Industry confined not only in our Country but the entire Universe as a whole. This entry was posted on Wednesday, December 24th, 2008 at 12:01 am	and is filed under Meri Awaaz Suno. You can follow any responses to this entry through the RSS 2.0 feed. You can leave a response, or trackback from your own site. I have compiled two CDs of Rafi saabs songs and gifted it to some of my friends.The CD has many uncommon songs sung by Rafi saab for the Panchratana music directors, Roshan,S.D.Burman,,Madan mohan Jaidev&,Naushad, besides S.J, O.P.Nayyar, K.A.and others. As a connoisseur of music, Iam in the process of making the third CD with another set of melodies. This CD is available with me at NO COST to all Rafi fans. Talking of Rafi saab, he was a true Avatar of GOD. It is said that whenever, God makes his presence, the entire battalion comes with him, So was the case with Rafi saab. The galaxy of actors, music directors,lyricists, during his period is a true testimony. No doubt Rafi Sb. is the greatest singer of the world and his personality is unique among all the singers. His sweet voice and his simplicity can never be forgotten as it is difficult to find a person who is a great singer and has a great personality as well. Rafi saab was a legendary singer. Many of his songs are simply nerve wrecking. Iam wondering why the higest civilian award – BHARAT RATNA was not confered on Rafi saab posthumously till now. We, the admirers of Rafi saab should strongly represent to the juries of the the padma award committee. The duet song – Piya Kaisee Miloon tujse – with Lata will simply touch the heart an soul of the juries. Is any one listening.? Happy Birthday to the greatest singer ever lived and a humble human being. 84th Happy Birtday to Legendary Rafi Sahib. Mere Geeton mein tumhi tum ho Mujhe Naaz Bhi Hai…..
Jisne soona kho gaya poora nasha ho gaya….. Many many happy returns of the day to the greatest singer ever Rafi Saahab. Long live the king of melody our beloved Rafi Saahab. Today is a special day for us and all music lovers . On this day our beloved Rafi Saheb, the “Awaaz Ke Jadugaar” was born who ruled the music world for a long 36 years and still touching the heart of all music lovers with his golden voice. This day is a very auspious day of the film hindi music industry the great playback singer Mohdrafisahab was born and he sang more than 26000 songs in his entire 35 yrs of his career. But one sad thing is there is no articles on his birthday in any newspapers. Fine. I remember one song “Baar Baar ye din aaye”. THANKS A LOT FOR YOUR BEAUTIFUL ARTICLE ON OUR BELOVED RAFI SAHAB’S BIRTHDAY ON BEHALF OF OUR ALL RAFI LOVERS !!! IN MY DIL FOREVER & FOREVER ! This day is a great day for all Rafi fans. Rafi Sb will remain our hearts forever as a voice of our hearts. God creates such gems once in centuries. Bijoorji by posting your article on the 84th Birth anniversary of Rafi Sahab you and this website have paid a tremendous tribute to the “gayiki ka shahanshah” as I often refer to the revered name of rafi sahab. such a voice was never heard before nor will it ever be born again. i join you in greeting all the rafi fans across the globe in humming the few words of birthday wishes penned by you at the end of your write-up. Rafi Sahab ki melodious and sweet velvet aawaz ke bare me agar yeh kaha jaye to beja na hoga.